ABURY is pioneering fashion by combining traditional, old world crafts with avantgarde design to create a new luxury style that fosters intercultural exchange and preserves world crafts. Help us to partner artisans and emerging design talent and benefit of a unique piece with a story. When I first came to Marrakesh in 2008 to renovate and open the Anayela, I didn’t know which adventure was still lying in front of me. Fascinated by the skills of the old craftspeople – I started ABURY in 2011 – a fashion platform to preserve traditional crafts through design. Since then whttp://www.abury.org/en/razil. We have been able to give back over 25.000 hours of education to women and children in 2013 through the ABURY Foundation. We have been recognized by the German UNESCO Commission to be an innovative approach to preserve immaterial cultural world heritage. This has been the most incredible adventure of my life! We will launch the first international designer contest, that gives grants and mentoring to emerging avantgarde designers to live and work for up to 3 months in a remote community – the ABURY Design Experience. 3) Increase our positive social impact in the communities. In 2008, Abury founder Andrea Kolb went to Marrakesh to renovate an old house in the Medina. On the site and while working with the craftsmen she found herself captivated by the immense handicraft heritage of the Moroccan people. These men and women passionately and skillfully carved, tinkered, blew, sewed and embroidered their way into, frankly, what can only be described as magic. Sadly though, some of these skills were vanishing as a taste for fast consumerism reached their shores. With them, the beauty, wisdom, identity and stories were also at risk of being lost to the past. Andrea realized that these cultural gems could be revived if explored in a new way – by infusing the old world appeal of handicrafts with a spunky twenty first century spirit. Doing so would allow many to earn their sustenance practicing their heritage and thus allow for a more inclusive and harmonious world economy. The aim for this collaboration is to pave a way for tradition to find not just relevance, rather delicious appeal on an international stage. And a dream was born. WITH PEOPLE, NOT FOR PEOPLE. Our cooperation is based on trust, respect, acceptance and appreciation of the cultures and people. 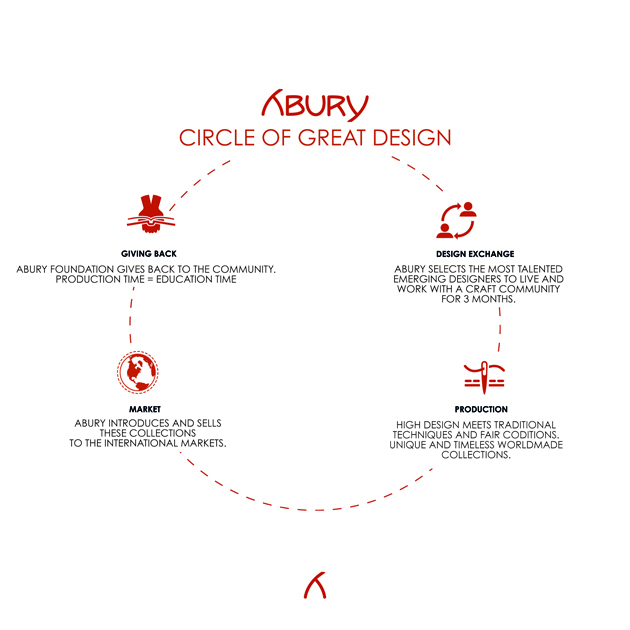 Our goal is to enable and encourage the people in the respective regions to once again use their traditional skills and to manually manufacture their unique products in the villages and to market them together with ABURY. One of the largest challenges is to make the people aware of the richness of their culture and uniqueness of their skills – only then can their full potential unfold. It took many visits to the villages before the people finally believed in themselves and understood that their traditions and culture still had an important role to play in a future, globalised world. This is the only basis upon which dynamism, passion and determination can be developed for new ideas.